The open air cycling track, or velodrome, before you is named for Marshall Walter “Major” Taylor. In 1899, Taylor, a renowned cyclist and world record holder from Indianapolis, became the second African American world champion athlete. 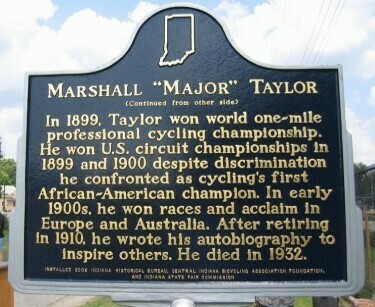 Celebrated abroad and hounded by racism at home, “Major” Taylor began his cycling career in Indianapolis. The Major Taylor Velodrome, now home to the Marian University cycling team, was built in 1982 for the National Sports Festival and used for the 1987 Pan American Games. 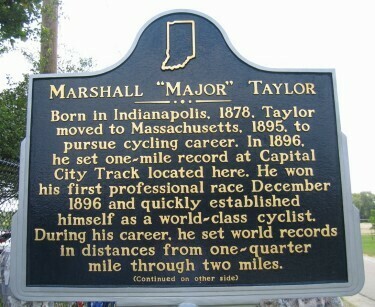 “Major” Taylor was born in Indianapolis in 1878. As a child, he became friends with the son of the Southard family which employed his father. For a few years, Taylor lived with the Southards, who bought him a bike. After returning to his own family at age 13, Taylor found a job at a bicycle repair shop. He often practiced bicycle tricks outside the shop, and when the owner realized this attracted customers, he gave Taylor a military uniform to wear during his performances. Thus the nickname “Major Taylor” was born. Taylor won amateur races in Indiana, Kentucky, and Illinois. His successes drew the attention of former cyclist Louis Munger, who became his manager. Munger was criticized for mentoring a black athlete and decided that his business ambitions, as well as Taylor’s career, would not flourish in Indianapolis. Taylor and Munger moved to Worcester, Massachusetts, in 1895. One year later, Taylor registered with the League of American Wheelmen as a professional rider. Over the next eight years, he became a world-famous athlete despite facing intense racism in the U.S. Some tracks banned him, and white racers threatened to injure him. In 1897, one opponent even attacked and choked him after a race. Yet by 1898, Taylor held 7 world records, including the 1-mile flying start (1 minute and 31 4/5 seconds). The following year, he claimed the 1-mile world championship title in Montreal. After a four-month European tour in 1901, he married Daisy V. Morris in Connecticut in 1902. He then went on three international tours, racing in New Zealand, Australia, and Europe. Daisy accompanied him during two of these tours, and their daughter Sydney was born in Sydney, Australia in May 1904. Taylor rested for two years at his home in Worcester before he launched a racing comeback in 1907, returning to Europe for a few tours. After early victories, Taylor’s age and weariness convinced him to retire from cycling in 1910. Over the next 20 years, Taylor lost money in poor business investments and became estranged from his wife and daughter. He moved to Chicago in 1930, living at a YMCA while trying to sell copies of his autobiography, The Fastest Bicycle Rider in the World. Taylor died in 1932 and was buried in an unmarked grave in Mount Glenwood Cemetery. In 1948, the Bicycling Racing Stars of the 19th Century moved his remains to a more prominent area of the cemetery. Schwinn Bicycle Company donated money for his tombstone. The Indianapolis Department of Parks and Recreation (DPR) presented a proposal for a velodrome in 1975. 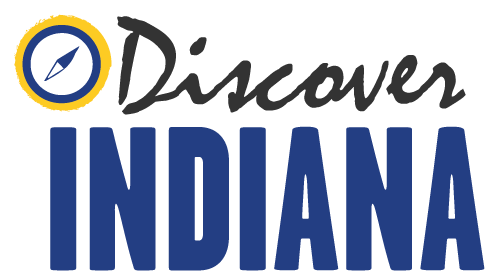 Fundraising efforts by DPR director Art Strong (a former cycling reporter) and the desire to make Indianapolis the “amateur sports capital” convinced the city council to launch the project. The track’s location near Lake Sullivan was selected after a feasibility study revealed its easy access. During the dedication ceremony of the Major Taylor Velodrome, Taylor’s daughter Sydney received a key to Indianapolis. When not hosting competitions, the Velodrome offers programs and classes to the city’s recreational cyclists. 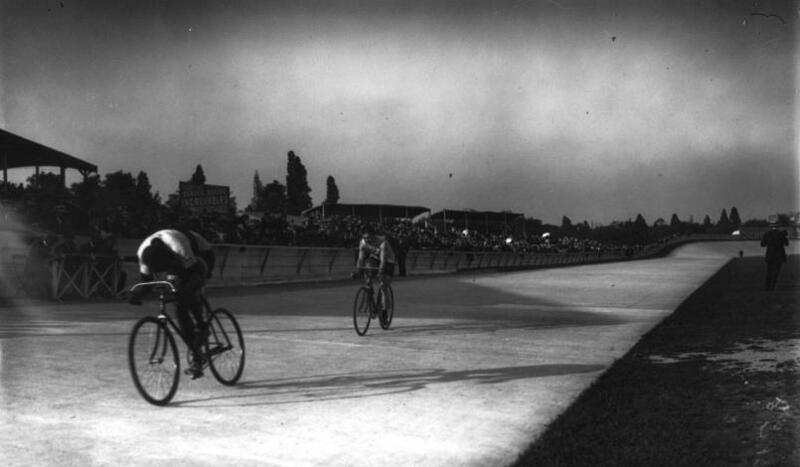 Cyclist Racing at the Stade Velodrome Buffalo, May 1909.: The start of track cycle race held at the Stade Velodrome Buffalo in Neuilly-sur Seine. The cyclists from left to right are Victor Dupre, Emile Friol, and Major Taylor. Image credit: Bibliotheque Nationale de France. ~ Creator: Press photography, May 31, 1909. 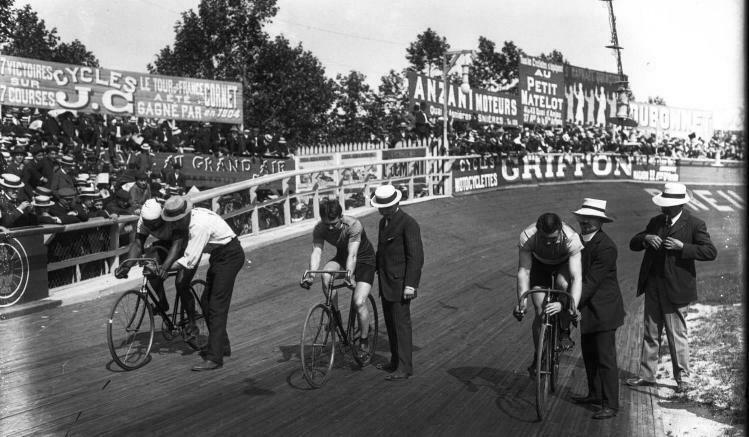 ~ Date: Cyclist Racing, May 1909. 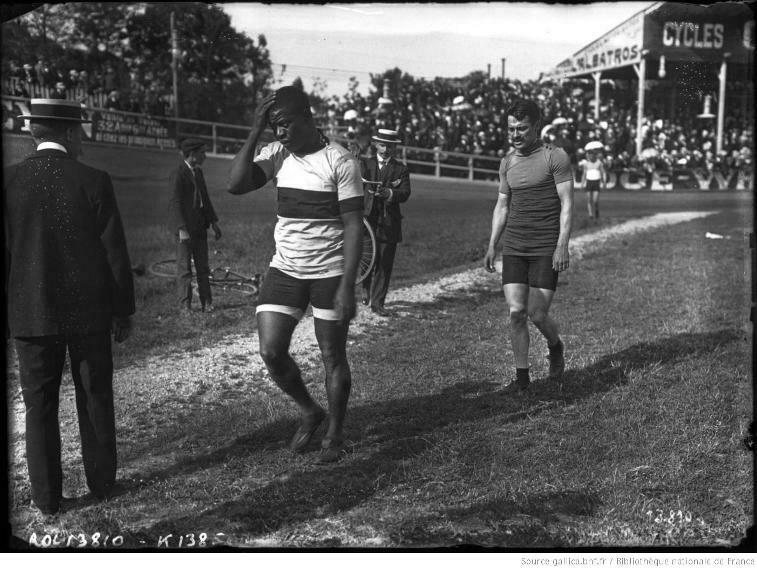 Taylor and Edmund Friol After Race : Marshall Taylor and fellow world track racing champion, Emile Friol of France, walking to the locker room after May 31 1909 race held at the Stade Velodrome Buffalo. Image credit: Bibliotheque Nationale de France. ~ Creator: Press Photography, May 31, 1909 ~ Date: Cyclist Race at Neuill-sur- Seine, Stade velodrome Buffalo, May 31, 1909. 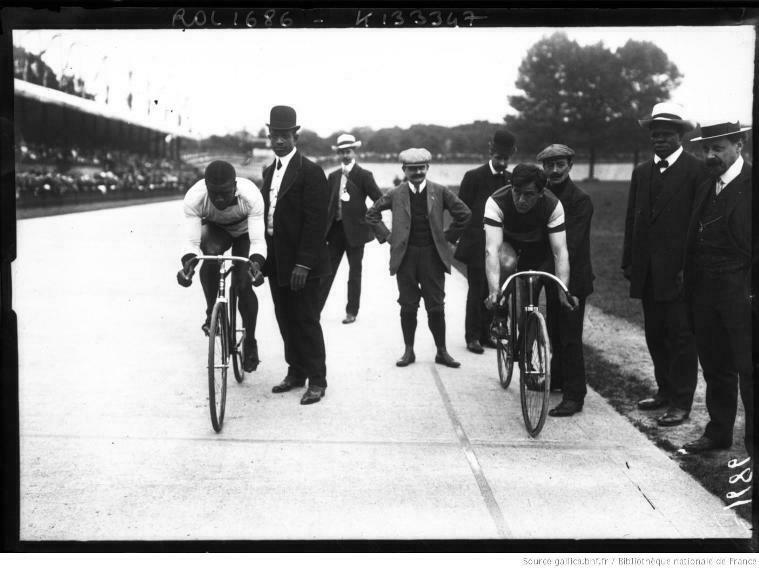 Cyclist Race at Stade Veledrome Buffalo, France May 29, 1908: American boxer Sam McVey steadies Marshall Taylor at start of 1908 race against France’s Gabriel Poulain (world champion in 1905) and Denmark’s Thorvald Ellegaard (world champion in 1901,1902, and 1903, 1906, 1908, 1911). 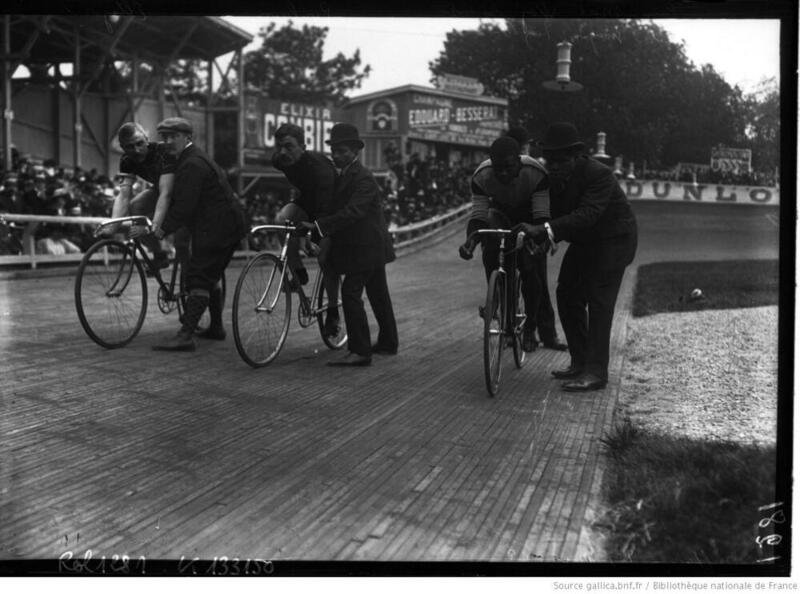 Image credit: Bibliotheque Nationale de France ~ Creator: Press photography, May 29, 1908 ~ Date: Cycling Race at Stade Velodrome Buffalo in Neuilly-sur-Seine, France, May 29, 1908. Marshall "Major" Taylor, Indiana Historical Marker: This historical marker is at the intersection of 38th and the Monon trail, across from the Indiana State Fairgrounds. The Capital City Track was located here. Photo Courtesy of Indiana Historical Bureau. ~ Creator: Indiana Historical Bureau ~ Date: This historical marker was installed by the Indiana Historical Bureau in 2009. Kaelynn Hayes, “Racing in the Velodrome,” Discover Indiana, accessed April 25, 2019, https://publichistory.iupui.edu/items/show/2. “City’s new bike track named for U.S. champion.” Indianapolis Star. May 28, 1982. Published on May 21, 2013. Last updated on Apr 2, 2019.